NEW DELHI: A per-country quota for Green Card means Indians face a huge backlog for landing permanent residency in the US. Plans by several US lawmakers to introduce a bill to eliminate this quota have led critics to argue that people from countries like India and China will corner the bulk of Green Cards. But Indians’ predominance in the work-related visa categories shows how they are the most sought-after professionals for US firms. In 2015, 33.4% of all longer duration visas — given for purposes such as work, study, asylum etc. — were taken up by people moving to the US for work. Of these, 1 million visas went to temporary and in-transit professionals and diplomats and intergovernmental agency officials. An additional 144,000 people were awarded green cards for employment based preferences. This is the category where Indians have ruled the roost for most of the last decade. 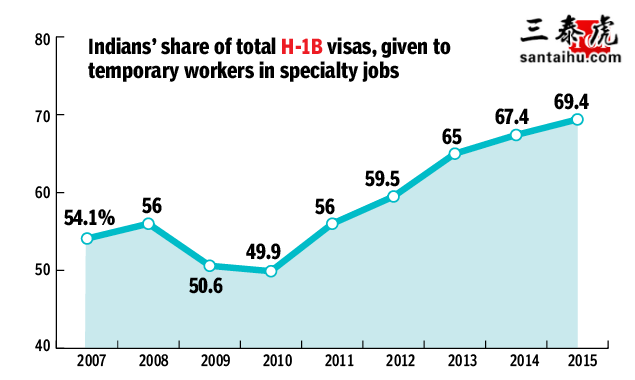 For the work-based H-1B visa, too, Indians are way ahead of workers from other countries and have mostly bagged the majority of these visas in recent years. Indians are the most sought after professionals worldwide, except in India where reservations rule and not merit. Allow reservation only at colleges and schools, so that the backwards get equal opportunity and the organisations get best talent. Indians can beat any country provided they get support from their own country. Wrong Headlines- China beats India. The Best Indians leave the country and never come back. Nadella, Nooyi, and Pichai confirm the failure of Indian system to retain the best. Thats why Indian American household income (2016) is $122,026- highest for any ethnic group in the United States. Hardly anything to be proud. Indians are desperate to leave the country because of pathetic living conditions.is that great? The average wage in China is about four times of that in India. Indian labour of all varieties, including the one under discussion here, comes cheap. The Indian so-called IT model is described, as low cost arbitrage outsourcing without IPR content. Most of the Chinese, after acquiring special skills return to the home country to work in industry and research institutions. China''s expenditure on R and D, both in the private and public sector is enormous. In many areas of technology it has moved ahead of the United States. That is the main cause of the so-called trade dispute which has little to do with trade. The United States is threatened technologically for the first time in sixty years. Nothing wrong in reservations per se in the Indian context.But, where we have gone wrong is in not fixing a time limit by which the reservations would be disbanded.I personally feel reservations should be phased out gradually.Do our politicians have that will? One important advantage that Indians have over Chinese is that Indians are comfortable with the English language. It is extremely important to maintain this advantage and increase English medium schools in India at the expense of those in local languages. Unfortunately state-level politics ends up imposing a huge and unnecessary burden on Indian schools to compulsorily teach in local languages, which are complete duds as far as career advancement goes. The reason is quite simple most talent is not admired by Indians because of known quota based discrimination. So smart people tries where their talent is admired and well payed. If you go the chart you will understand that Indian looking for citizenship abroad is increasing. Other country citizens probably stay back or ready to work in their own country. But every professionally qualified Indian always look for the opportunity abroad. In India, even though vacancies are there, the recruitment process crawling and youngsters loses their opportunity. Therefore, if they get chance they fled the country and chance for their comeback. China retains their best brains in their own country by giving them opportunity to research and develop and also research by doing reverse engineering of most advanced systems developed by others. The Chinese who migrate for higher technical education or technical work are guaranteed jobs if they return . In our country, merit has no place. Even if someone wants to return he is not guaranteed job due to caste policies. He will find morons and politicians bossing over him even on technical matters. Wipro, Infosys, TCS are working for major multinational firms using Indian workforce but they value merit. The day, these useless political leaders force them to recruit based on caste consideration for getting votes, that will be the end of these firms. That''s why technological development stagnates in our country and we end up importing high-end equipment from other countries. Meanwhile, China produces everything from Mosquito bats to Rovers that land on the moon. Is this like a consolation? They smack us to the ground in most other fields. Among the migrants, I think India and China are competing more for everything. High time things at home improved. More manufacturing units and research and development facilities are encouraged. The quality of education at Primary, Secondary and Higher Secondary level should be improved. Communicating skills and trade skills should be given priority. Indians not only get overwhelming number of H1-B visas; they also work in much higher paid jobs in North America. Chinese are in low paying jobs; most of them are in the minimum wage category.